The presentation, the features, the results – brilliant is the only word to describe the KBL 7900 Alpha Deluxe from PC Tan. By simply being in its presence, tanners know they have stumbled onto something utopian. Help them indulge in an experience that wipes away chaos with relaxing amenities. Even more than a tanning bed, the 7900 Alpha Deluxe is a bright, peaceful destination that your customers will look forward to from the moment they leave it. The 7900 Alpha is all about more. More lights, more power, more tan. With total lamp wattage of 11,780w, there won’t be a square millimeter of underutilized space. Thirty canopy lights – including four 500w facials and six p2 lamps – provide ample coverage in the spacious bed. Paired with two shoulder lamps and 24 lounge lamps, it offers a perfect tan at any angle. Even at first glance, the sunbed welcomes users with a tantalizing light show. Having colorMotion installed, you are only a few clicks away from your own favorite color concept. If you want crowd-pleasing equipment, give your clients a bed that allows them to create a tanning experience as unique as they are. PreSelection allows users to choose from many options before the session begins. AquaCool provides a refreshing mist using non-drop nozzles in the canopy. Aroma unleashes a wave of euphoria through two fragrances.. Air conditioning completes the trifecta of absolute comfort. For the manual features of the bed, megaVoice assists tanners to keep the user experience easy. With all this luxury, the cherry on top is the ability to let users listen to their own carefully collected music as they gracefully graduate on the bronze scale. Plug in an SD card or an MP3 player to quickly transform the solarium into a concert hall. The unit’s volume control makes adjustments easy. Bring this top-of-the-line sunbed to your salon for an upgrade bed your clients will drool over. 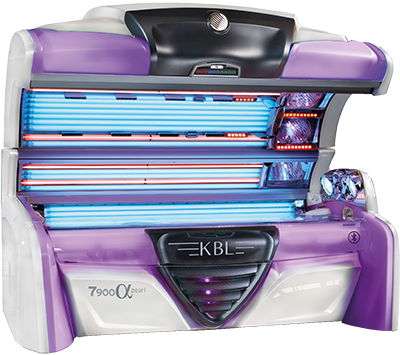 For more information about the KBL 7900 Alpha Deluxe, call PC Tan at 800-FASTTAN (327-8826) or visit www.pctan.com.